My husband and I decided to have an early dinner at Peli Peli Vintage Park. We had reservations for 4PM and Alia sat us in a beautifully decorated space. The lighting and ambiance are as unique as the food. Our Server, Sonia, brought us our menus and took our drink order. We decided on a bottle of Left Coast Cellars Pinot Noir (at Sonia’s recommendation). This paired wonderfully with the appetizers, entrees and dessert. And it was 50% off – Bonus! Sonia recommended all the dishes that we tried. She knows her food! We started with two appetizers. First was the Calamari. 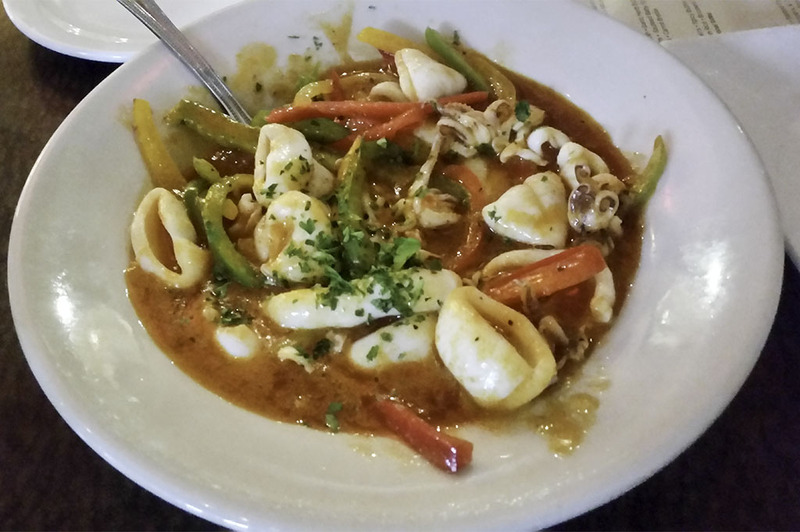 This isn’t your traditional deep fried calamari but instead sautéed with peppers and Peppadews w/a spicy butter sauce. The sauce it was served in could be a soup all on its own. This was some of the freshest calamari I have ever tasted and the peppers were cooked to perfection with just the right amount of crispiness. Next out was the Bobotie. To be honest, I wasn’t sure about this one at all. Man did Chef Paul prove me wrong on that one! We were instructed to spread the mango chutney around the top of the flaky pastry and then to spoon all the way to the bottom to make sure we got a part of each yummy layer. So with a spoon full of mango chutney, flaky crust, carrot bredie and curried ground beef I dove right in. The flavors were nothing short of amazing. I wasn’t sure what carrot bredie was and was told it was like carrot mashed potatoes. One of the most unique flavors I have been adventurous enough to try. The curry was nice and sweet and the entire dish had us diving back in for another bite. There are no salt or pepper shakers on any of the tables for a reason at Peli Peli – these dishes do not need it. Save the salt for Margaritas! Flavor pours over each plate on its own merit. Additional napkins might be a requirement though. For our entrees I chose the Espetada. It’s a basted beef filet hung from a skewer with garlic butter dripping down from the top. 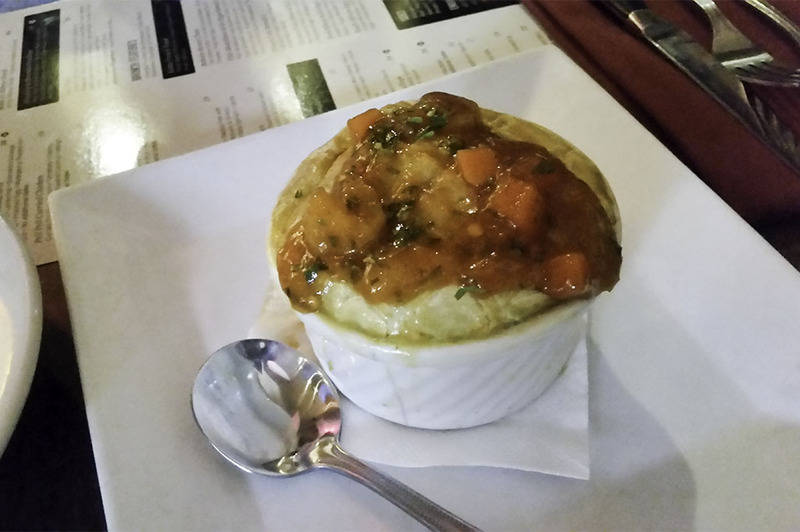 This is served with sautéed spinach, roasted potatoes and carrot bredie. The meat was cooked to my liking and was extremely tender. All the sides accompanied the meat exactly as Chef Paul intended. Sonia explained that the honey mustard vinaigrette shredded carrots acted as a pallet cleanser between all the wonderful side items. This worked perfectly! 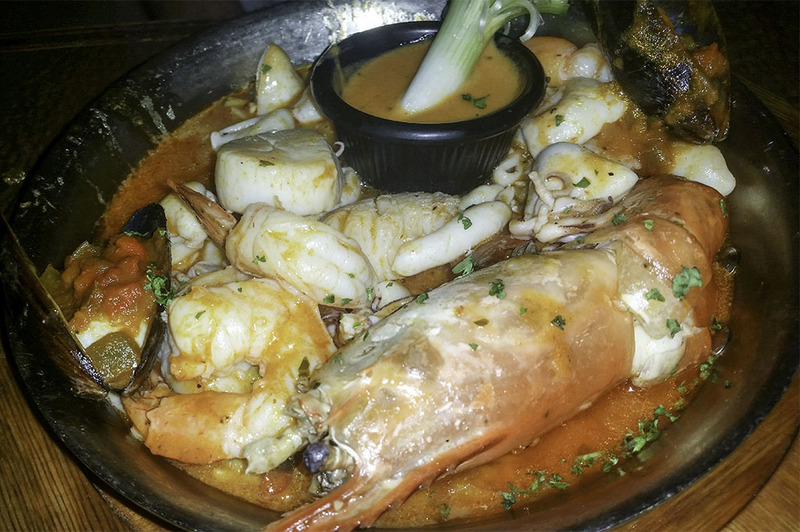 My husband ordered the Capetown Skillet – Tiger Prawns (the size of lobsters), scallops, Peli Peli shrimp and sautéed calamari. Everything was tender and flavorful and the South African rice in the Peli Peli sauce had so many flavors it couldn’t be eaten quickly enough. While we were savoring our entrees, Sonia explained the history behind the panel decorations, the ceiling concept and Peli Peli itself. I’m not going to spoil it on here; this is truly a unique story that needs to be experienced at Chef Paul’s restaurant. It only added to enhance our already lovely meal. For dessert we split the Sticky Toffee Cheesecake. This recommendation, as all the others, did not disappoint. It was thick and flaky at the same time. Chunks of toffee and creamy caramel sauce made this dish my new go-to dessert! I wasn’t sure what to expect for South African cuisine, but this place is a hit and Chef Paul is a genius. Just made this a regular on my restaurant choices and possibly number 1 on my list! 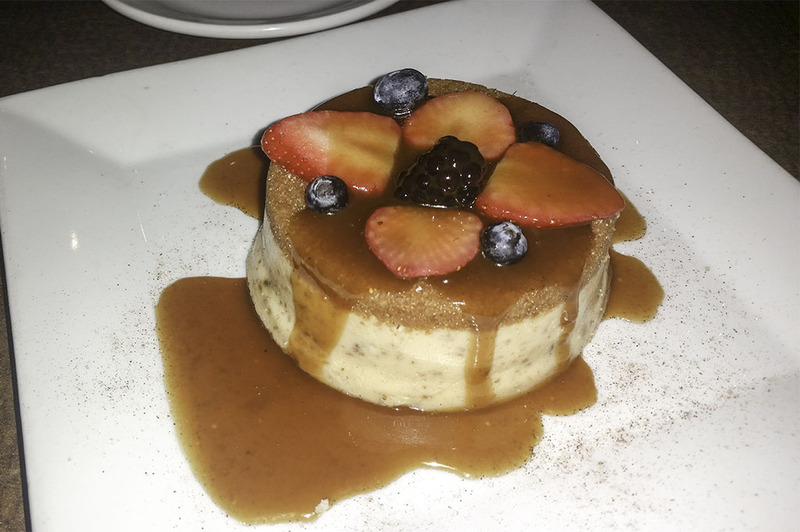 From the appetizers to the dessert – everything was delicious and full of flavor. As a side note – Chef Paul has a book that can be purchased for $20 that gives his entire story and includes about 30 of his signature recipes.